Hidden away from the mainstream, the incomparably lovely state of Himachal is fashioned of the stuff from which dreams are woven, a place created in the mind of a poet in love. For sheer geographical diversity, few places in the world are as richly endowed. Low rolling hills, just a couple of hundred metres above sea level, gradually soar to touch the core of the western Himalayas. The state encompasses in its fold, a series of magnificent valleys, temperate forests, and towering peaks, some of which never lose their perennial snows. However, for photographers, there is another dimension to this enchanted place: The land offers tremendous seasonal variety. Beginning with summer, the weather gods provide the gold and sunny days during which bird songs and gurgling mountain streams blend in a strange, enchanted symphony. The exuberance of the monsoon transmutes the landscape into a verdant miracle. It alternates between swirling mountain mists and the soft, silky, soothing, sibilance of falling rain. Then comes the snowy, brooding silence of winter, when the higher valleys are locked in snows so deep that most roads are closed, and only a few brave trekkers venture forth to delight in the white, unsullied and virginal beauty of the land. 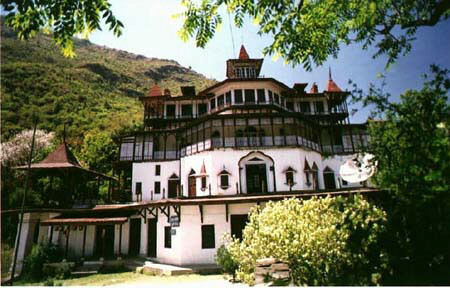 I decided to do Himachal midway through March, a month before the official opening of the tourist season. This is primarily due to an almost paranoiac aversion to the multitudes of sharp elbowed, jostling tourists who swarm like locusts over the land. The profoundly moving words 'take only pictures; leave only footprints' is a meaningless, mindless term for most of this breed. Starting from Delhi, I caught a convenient and comfortable overnight train to Shimla. I waited here only long enough to board a bus for Sunni, a 'town' so small it does not feature on any map. I was looking forward to meeting an old friend and his father, the erstwhile ruler of the place. The father and son live in a gem of a 'palace' with a panoramic view of the valley and the not so distant blue hills. I spent a couple of days ambling around the one street town, shooting a few lack-lustre pictures. However, my host's haveli is an exceptionally rare architectural jewel. In the early morning sunlight, it looked a truly fitting abode for a ruler. I clambered up the sloping roof of the pump-house opposite, the only place from which a 20-mm wide-angle lens could cover the whole edifice, with minimal perspective distortion. Precariously balanced on the slate shingles of the roof, I shot off a few carefully composed frames. Climbing up had seemed ludicrously simple, but the descent posed peculiar logistical problems. My friend, Moh Chandrapal Singh tried persuading me to use a ladder. However I sensed rather than heard his unsuccessful attempt to disguise a guffaw, as a cough, and my wounded ego refused to hear the voice of reason. After much grunting, (and bruised elbows and shins), I finally touched terra firma, and joined him in a well-earned flagon of beer, chilled to a regal nicety. The day was beginning to get warm and the amber liquid was nectar-sheer and sweet. On the second evening, I headed for Kullu, stopping briefly at Mandi, which is renowned for its 81 old and exquisitely carved stone temples. The locals claim that every lane in the town boasts at least one temple. Early next morning I was on my way to Kullu. The bus was over-crowded and I was squashed between a wizened old lady and her big-bellied husband, his breath reeking cruelly of garlic. Muttering imprecations under my breath, I cursed myself for not bringing a gas mask with my gear. After an eternity, we reached the town of Kullu. With a desperation born of deep suffering, I fought my way out of the bus into the clean, crisp and invigorating mountain air. 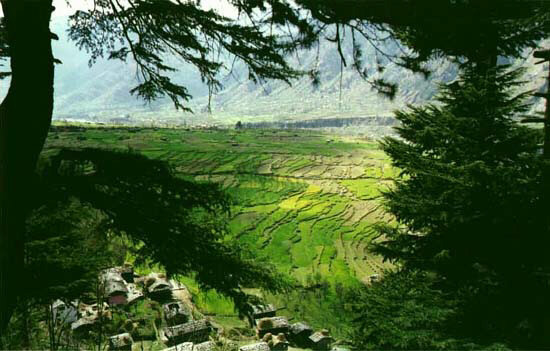 The rich green valley of Kullu is the cradle of the river Beas, and lies nestled between the Dhaludhar and Pir Panjal ranges.With a plenitude of apple orchards, golden fields of mustard, green alpine meadows, and tranquil lakes, I realised why Kullu is called the Valley of the Gods. A pleasant, twenty minutes walk from my hotel offered a superb, low angle view of the river against the backdrop of the blue hills. Snapping on a 24-120 mm zoom, I placed my eye against the viewfinder and noted with great satisfaction that the polarising filter removed all unnecessary reflections from the water, and heightened the blue of the sky to a deep sapphire, providing a strong contrast for the cotton-wool clouds. Two days later, my taxi was on its way to Manali. 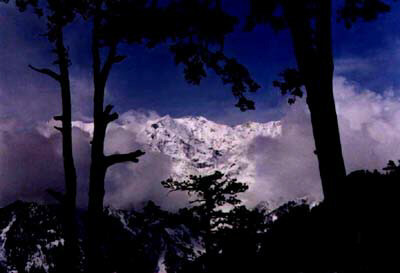 I stopped at Naggar from where the valley appeared spectacular beyond measure and merited a whole series of pictures. I was tempted to visit the Roerich Art gallery at Naggar but, pressed for time, I decided to forgo this pleasure. Instead, I set off on a 3-hour trek through the Chanderkhani Pass to reach the extraordinary village of Malana. Part of this journey was done on yak-back and the remainder on foot. The local people have a legend that Alexander the Great passed this way on his march of conquest. On leaving, he ordered some of his men to remain behind, here. Most of these married local women, giving rise to a unique society with its own political and judicial systems. The odd, strangely robed figures carved on the ornate woodwork of many of the homes here, tend to support the local belief. 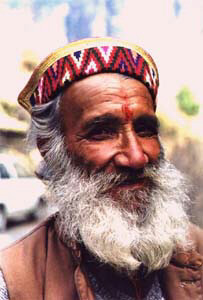 In Himachal folklore, Malana is considered the world's oldest surviving democracy. 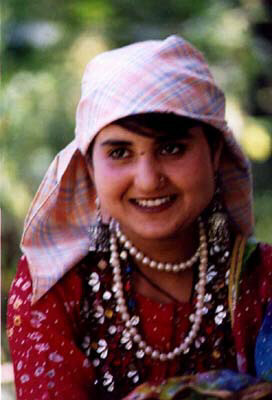 The villagers of Malana are a warm and remarkably handsome people. They smile easily and are conspicuously at ease front of a camera. I would have loved to spend another day in Malana, but the thought of my taxi waiting at Naggar, gnawed at the back of my mind. With the promise of mailing copies of my pictures to them, I reluctantly bade goodbye to my new friends. My taxi driver Sundar Singh was worried sick at my long, eight hours' absence. However, his face broke into a massive smile as he spotted me. To celebrate his profound relief, he insisted that I join him in a 'king-size' glass of tea at the roadside stall. The occasion merited second and third rounds, he asserted vehemently. Later, with a disarming smile he hinted that local etiquette required I pay for the 'celebration.' I laughed and obliged. It was dark by the time I checked in at the Rohtang Manalsu Hotel, in Manali. My room was spacious, comfortable but without any frills, and the toilet was immaculately clean. A hot shower, followed by a large Scotch-and-soda did wonders for my tired body and flagging spirit. I ate a Spartan dinner and lingered a while, luxuriating in the sybaritic pleasure of warming a wafer thin brandy snifter between my palms. Then I headed for bed. I am certain I must have fallen asleep even before my head hit the pillow. That night, with the magic of Malana still fresh in my mind, I dreamed of the triumphant march of the conquering Greek army. My trusted Nikon, set on continuous mode, purred happily as the village of Malana smiled and enthusiastically clasped the handsome young Macedonian to its bosom. However, my gossamer dreams of nubile feet dancing to the jingle of ankle bells, of happy laughter, of joyous revelry, were regrettably short-lived. They dissipated with the persistent knocking of the hotel waiter, bringing me my early morning 'bed tea'. 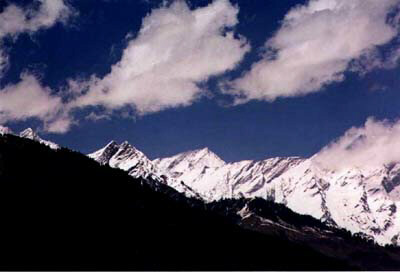 Manali is situated at the head of the Kullu valley and is circumscribed by serene, majestic mountains on three sides. From mid-April to June, its undulating meadows present a wondrous panorama of multi-hued wild flowers. However, if you yearn for views of clear blue skies and snow-capped mountains, then visit Manali during October and November. Walk a couple of miles out of the town, and you are confronted with stunning vistas of turquoise skies, snow-bound mountains and the yellow-gold of mustard fields. Point your camera in any direction, and you have a picture waiting to be frozen forever.